Fortnum & Mason Food & Drink Awards Food Book of the Year 2015. The Third Plate will revolutionise the way we eat. It charts a bright path forward for eaters and chefs alike, daring everyone to imagine a future for food that is as sustainable as it is delicious. 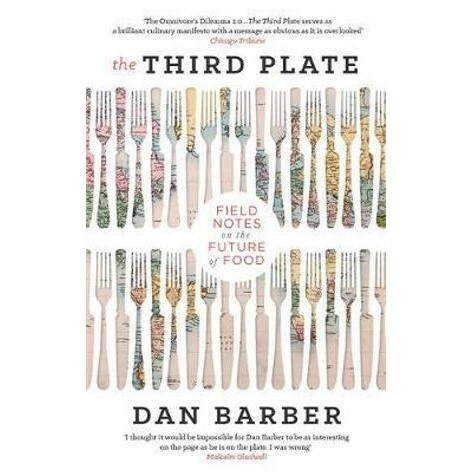 Based on ten years of surveying farming communities around the world, top New York chef Dan Barber's THE THIRD PLATE offers a radical new way of thinking about food that will heal the land and taste incredible. The 'first plate' was a classic meal centred on a large cut of meat with few vegetables. On the 'second plate', championed by the farm-to-table movement, meat is free-range and vegetables are locally sourced. It's better-tasting, and better for the planet, but the second plate's architecture is identical to that of the first. It, too, disrupts ecological balances, causing soil depletion and nutrient loss - it just isn't a sustainable way to farm or eat. The 'third plate' offers a solution: an integrated system of vegetable, cereal and livestock production that is fully supported - in fact, dictated - by what we choose to cook for dinner. THE THIRD PLATE is where good farming and good food intersect. Dan Barber is the Chef of Blue Hill, a restaurant in Manhattan's West Village, and Blue Hill at Stone Barns, located within the nonprofit farm and education center, Stone Barns Center for Food & Agriculture. His opinions on food and agricultural policy have appeared in the New York Times, along with many other publications. Barber has received multiple James Beard awards including Best Chef: New York City (2006) and the country's Outstanding Chef (2009).